...is set in the Cheviot Hills on the edge of the Northumberland National Park. 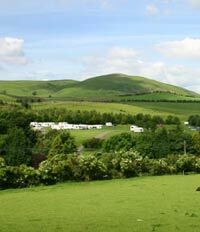 We are the perfect base to explore the sights of Northumbria and the Scottish Borders. The area boasts a varied landscape including the magnificent Northumbrian Heritage Coastline featuring traditional fishing villages and unspoilt golden beaches. Famous landmarks include Holy Island, the Farne Islands bird and seal sanctuaries, Bamburgh Castle and not forgetting the home of 'Harry Potter' in Alnwick Castle which also includes the recently opened Alnwick Ornamental Gardens. We are also a short drive from the historic border town of Berwick-upon-Tweed on the northern most reaches of England. 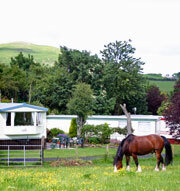 Spacious designated area for tents, caravans and motor homes (with electric hook-up facility). Please note we do not permit groups of tents or tourers on the park. Wooler , a typical Northumbrian market town is located only a short walk from the park. Discover delights ranging from traditional Northumbrian fayre to home made pottery. There is something for everybody all within a short distance from us. Click through the pages on our website to learn more about the park and the tourist attractions in the surrounding areas. We look forward to making your visit a memorable one!